"Fifty-four percent of the American public believes drugs will never be legalized because then 'the copswould have to buy their own.'" While I don't always agree with what he might say or do, Michael Moore has been one of my favorite political comedians, for lack of a better term. Not really a comedian, Moore points out so many obvious and hilarious things about the US government that he manages to expose problems by making them darkly humorous. Moore first burst onto the scene with his superb documentary Roger And Me, in which he attempted to get a brief interview Roger Smith, the (at the time) CEO of General Motors who was responsible for the loss of hundreds of jobs in Flint, Michigan. All Moore wanted was an interview, but instead, his documentary was an odyssey of how Roger Smith continually avoided any and all criticism of his company (he never did get to talk to him). As a result, his portrayal of the people of Flint, both funny and tragic, gained him folk-hero status as a "man of the people." Moore's brief moment on network television was TV Nation, a daring series inwhich he used his harsh, in-your-face style of black humor to assault greedy corporations and problems with the government. The show was almost immediately taken off the air when the network airing it felt the heat from his controversial ideas. In 1999, Moore was given the chance to do a similar show to be aired in Britain (thought it also hit the US cable circuit), only without quite the same level of risk of being cancelled. The show, The Awful Truth, was nearly identical in format to TV Nation, and just as scathing. Presented in this box set DVD is the first 12 half-hour episodes (the first season) of The Awful Truth. It almost goes without saying that if you've never liked Michael Moore's approach to politics, there's not much point to watching this show. You have to be at least a bit sympathetic to his ideology or you'll probably just turn off the TV in anger that your sensibilities are being violated. That said, if you're just a little bit tired of or disgusted by either some of the government's behavior or Capitalism at work, The Awful Truth may interest you. Take, for example, the first episode in which Moore brings a group of men and women (all dressed in Puritan attire) to the US Congress intent on finding and exorcising "sin," claiming it to be a cheaper and quicker way to perform a witch hunt. His implication, of course, being that the money spent on the investigation of Bill Clinton's affair with intern Monica Lewinsky was a disservice to the taxpayers. You might not agree with the technique, but he does raise some valid points and, quite hilariously, points out the hypocritical nature of many of those pointing accusing fingers. As much as I dislike some of the people seen during the course of this show (from various political characters to CEOs of large companies) I almost felt sorry for them with Moore on their back. He's ruthless, unrelenting, and cruel. I don't entirely agree with his methods, but he certainly does get results, even if it's just convincing a few people in his live audience that his cause is just. I am comforted a man like Moore exists in today's environment where many peoplegleefully praise journalists and TV show hosts who bathe in their own controversy, but yet in reality, shy away from being truly controversial, in order not to lose their jobs or gain disfavor with sponsors. For all his faults, he does not seem to care about these things. As entertaining as The Awful Truth is, especially given the average, sterilized quality of programming normally seen on networks, there are some issues that bother me about the show. Primarily, Mr. Moore seems to have too much of an ego. I think his folkhero status has made him forget that, while he is creating a show in his vision, the issues are distinctly for all of us to be concerned with. He rarely seems to allow others a share of the spotlight whenever he's butting heads with an organization or person. On occasion, Moore gets a case of "only I can save you from the big, bad corporation." He wants to be the good guy and, for the most part, an ordinary American, but I think he still knows he's (for lack of a better term) a celebrity. He's an important voice in the country, though, and one who, although ignored by so many for so long, seems to attract enough attention to be labeled various things including a "terrorist" only recently. I don't know, it's hard to be frightened of a short, slightly overrweight guy in a ballcap and sneakers who just speaks his mind. Image Transfer Review: There are few complaints in the image department; the source material (which appears to be average, television video) is without any damage or physical problems. The transfer itself runs along smoothly with no issues, other than some minor, occasional pixelation in background textures of particularly dark scenes. Colors and light/dark level are well rendered and are of expected quality. Most of the show is done on in-the-street home video, so the transfer manages to handle the sharp and chaotic camera movements well without exaggerated streaks or artifacts. Audio Transfer Review: The stereo audio is clean and sharp, but nothing all that special. It gets the job done, but is not going to blow away viewers with demo quality sound. The most directional effects are in the live portions where Michael Moore addresses an audience and the applause and yelled-out comments come from all over. Otherwise, the soundtrack is pretty limited and mostly dialogue based with some light music in the background. 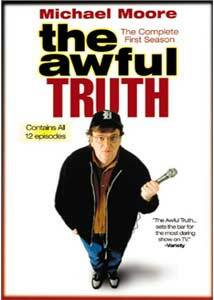 Extras Review: There is a short biography of Michael Moore and each disc contains some Awful Truth quotes; the quotes from the random polls conducted for the show, often on strange topics. There are weblinks to the Docurama website as well as parent company New Video's website. The boxed, two-Amaray case includes advertisements for other Docurama programs.